My story with Busra al-Sham Castle started at an early childhood when I visited it with my father to attend a concert in 1985. Although of my early age, but the crowded place of the attendants gave me a good impression about who is fairuz. However, we couldn’t attend the concert after all this long journey passed by the car. Fairuz didn’t sing for a long time as expected from her public, because she left the stage complaining about the security police behaviours towards her public when they started using the sticks and batons to regulate the crowds who came from all over Syria. Her departure accompanied by the departure of most of the people. This scene was a disappointment for me to listen to fairuz for the first time and live. When the security forces interfere with any concert, theater or a festival ultimately they have to destroy it. In this concert Fairuz sang for the first time the lovely song (Ya Ra’I Al Qasab) which means( Hey Cane Shepherd) when her public and the people of Horan where Busra al-Sham Castle exist considered it as present from Fairuz to them as it simulates their cultural recent history life. Busra is 40 KM east of Daraa and 140 KM south of Damascus. It is considered as a civilised and architectural landscape, it exists in the conscience of every Syrian. It is not only known by the people of its area, for interested one the world can walk inside it and moves between its departments through it corridors and have a close eye on all its decorations and its because of the so many researches and studies have been done to the castle. Even though as any Syrians, words like UNESCO, UN .. etc. are no more meaningful to them because they tried them and knew they are only bureaucrat offices have no powers and it’s useless to call them to protect what they themselves consider it as a humanitarian civilised heritage. I still remember my mathematics teacher when I was in the secondary school in 1998, he was so interested in the history and heritage of the castle, and was always complaining about the negligence towards the castle and always wondering how a country contain such a antique of civilisation could ignore it , while what’s less in matter get the attention of all the people and thousands of tourists come to it from all over the world. Even more how for a country in need to vary its income resources leave such a precious treasure without exploiting it. According to the statistics and researches that our teacher have made, Busra Castle equals the monuments of Rome as a world historical civilisation landscape, so it might be a considerable national income resource and to be counted in the state welfare by numbers may compete with oil fields. In the first months of the Syrian revolution in 2011. The Syrian regime has targeted the king’s daughter bed by their bombs which is one of the well known historical architectural landscapes in the Busra Castle, where the legend say that a king ordered of building a high bed on columns to achieve immortality for his daughter by taking her far from the death causes, but unfortunately a scorpion was hiding in her fruit basket. When she stretched her hand to the basket, the scorpion burr her and she died. What may happen if that king achieved his goal, we would mourn his daughter who lived for thousands of years to be killed by Assad regime bombs. Nobody of us were reassured about our heritage in the hands of such regime. I remember a rumor widely spread between people and so many talk about , that Busra Castle is based only on one stone in its ground base and if this stone moved for any reason the whole castle will totally ruin on the ground. This rumor was just an expression of our obsession from the coming days. And we are living it today with this regime going by us to the abyss otherwise why all this negligence and ignorance to the castle. Busra Castle is a completed theater with all its details and corridors to give any all its arts the absolute reasons to be done well. Recently the regime have destroyed the changing square behind the theater . 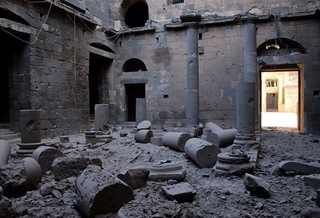 I hope their won’t go through it anymore to let Syria as an open air museum as we knew it. A witness for the civilisation of Syrians and their great history far from the barbaric Assad and his circle.